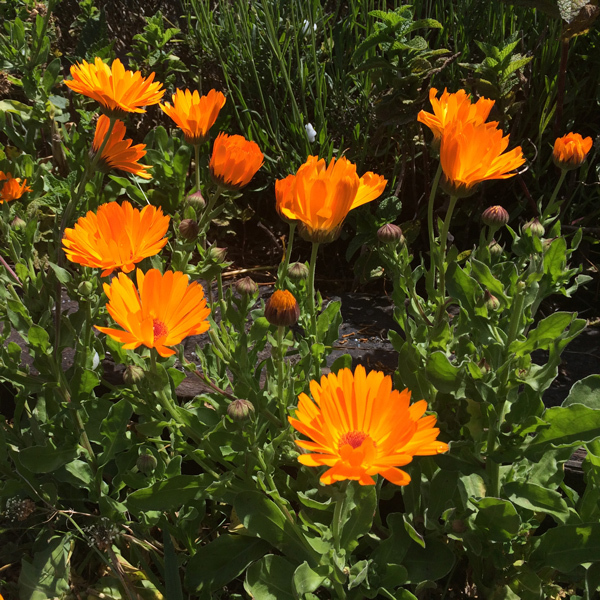 Calendula Flowers (Calendula officinalis) are cheerful and easy to grow, so invariably find a way into the hearts and gardens of all herb lovers. Usually cultivated as an annual, calendula can be easily be grown as a perennial in warmer climates and will reseed naturally. Calendula is sometimes called marigold and pot marigold and this confuses it with members of the genus Tagetes, which go by the same common name. Marigolds in the Tagetes genus are in the same family as Calendula – the Asteraceae (Sunflower family) – but they are not interchangeable with calendula in medicine. When you pick calendula, your fingers will be sticky from the resinous bracts, which form the green base of the flower head and the leaves. The resin has a distinct smell and is an important part of calendula’s healing power. It has been used medicinally for centuries to heal wounds, burns and rashes, internally and externally. You can use the leaves and flowers as a poultice for sprained ankles or cuts and both leaf and flower can be added to healing salves when you make them. Tests of Calendula oil suggest that it promotes tissue growth and chemically enhances immune response to infection. Crush fresh flowers and upper leaves (extracting the resin) directly on skin to spots you suspect can be staph infection – the essential oil of this plant can also be used in such first aid cases. The flowers are rich in bioflavonoids that aid the eyes and are generally highly anti-oxidant. The whole flowers can be eaten fresh, broken over salads and omelets, or dried, and added to soups and stews in the winter as an immune tonic. Calendula’s bright healing energy ‘brings light to places where the sun don’t shine’, is a folk saying that refers to its ability to help move stagnant lymph and deal with yeast infections as well as brighten one’s outlook during the cold, darker months of winter. To make a calendula oil that you can use as skin moistener, baby oil (helps with diaper rash) or in salves, just collect fresh calendula flowers and carefully dry them out of direct light for a few days (so they are wilted and nearly dry). Then put them in a jar and cover them completely with olive or jojoba oil (mix well). Store in a warm dark place for 1-3 months (the longer the stronger) and decant/press out the golden oil.